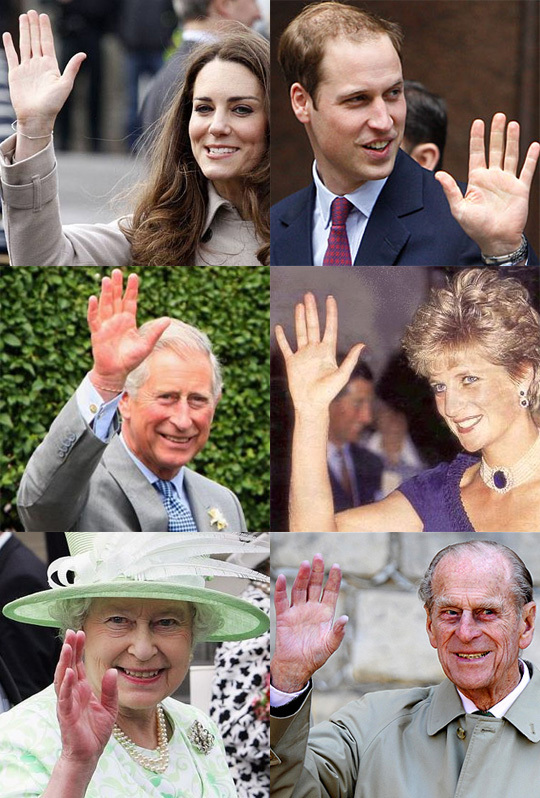 ROYAL HANDS - Prince William & Kate Middleton vs Prince Charles & Lady Diana! Let's talk about the hands of Prince William of Wales & his future wife Kate Middleton, who's Royal Wedding will take place tomorrow (april 29)! The media say this is going to be the 'Marriage of the Century', so... let's talk about their hands!!! 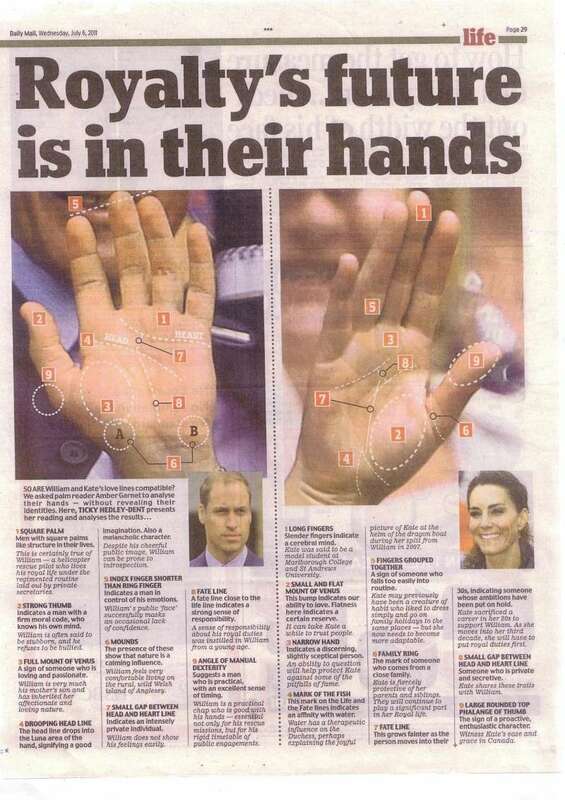 An interesting feature, Prince William is left-handed... how will that influence the 'magic' of this marriage? And let's take a closer look at the hand of Kate: both her ring finger & pointer finger are pretty long (the longest in this family I would say)... and her 2D:4D finger length is pretty low for a 'lady' (below 0.95). Actually, this is a typical 'male-like' characteristic - in terms of 'temperament'! Will Kate be able to keep herself 'in control' in this marriage? Or... is Prince William taking a considerable risk with this former 'catwalk-queen' (during her student years) - who was only a few years ago (2002) walking on stage dressed with not much more than a few pieces of lingerie. 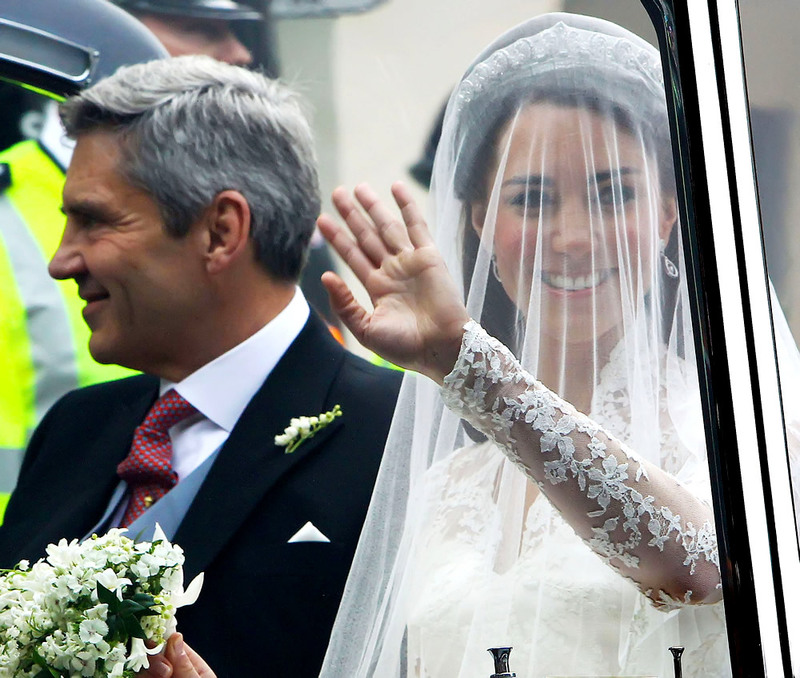 Kate Middleton's catwalk moment is also featured in the movie 'William And Kate', which was released earlier this month (april 2011). ... I wonder: what would Lady Diana (Prince William's mother) have thought about her son's future wife's catwalk-costume? Anyway, to me it looks like this is not going to be a 'boring' Royal marriage tomorrow...!? Re: ROYAL HANDS - Prince William & Kate Middleton vs Prince Charles & Lady Diana! Considering Princess Diana went out dressed in a fur coat and completely naked underneath, I think she would think Kate's catwalk outfit lovely, but maybe wearing too many clothes, However, Diana, I believe,was unbalanced, so I don't know what Kate's excuse is. Whatever happens William and Kate can do no worse than those before them. There is no hard act to follow, but life is full of suprises and they might turn out to be worse than all who've went before them put together. Yet again they might be okay. What an amazing change that would be. 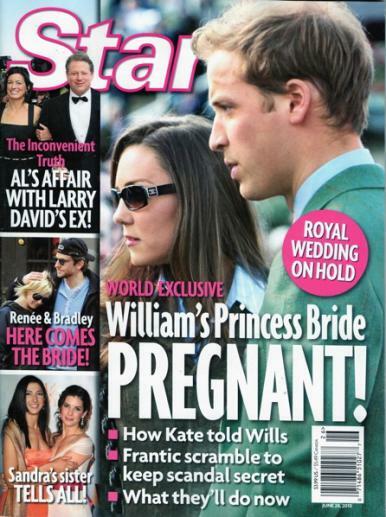 I did not know about that side of William's mother (though I was aware that she was not very stable). But I really enjoyed reading your comment. Myself, I am not really a 'Royalty' follower - but I do understand what kind of life they are supposed to live, giving birth to children, and pleasing the media. But Kate appears to enjoy all attention, and she certainly is much better prepaired than Diana was at age 19. So that might make the difference. 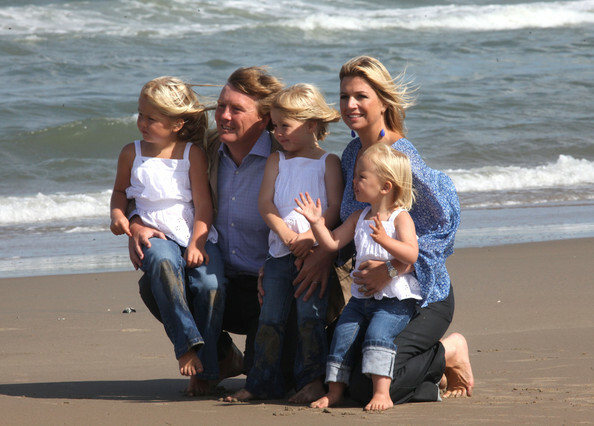 Anyway, we in the Netherlands have a bit of a likewise situation... with our blonde 'King-to-be' Willem-Alexander & Maxima (the pretty blonde from Argentina). But even after giving birth to three blonde princesses (our King-to-be is a blonde himself as well) ... both are still doing pretty well. Though, while Maxima has a few million 'followers', Kate might be confronted for the rest of her life with about a billion 'followers'... including tousands of paparazi of which some of them will behave like 'little monsters' - just to make that once-in-a-life-time scoop that will make them rich for the rest of their life, etc. I can imagine that 'phantasy-scoops' like the one printed on this cover, never get succeeded by an apology for writing nonsense, etc. And I can also imagine that Kate's lovely charme & appearance (+ IQ and EQ) has brought her into that position, but the same qualities can give the papparazi an endless boost of energy to follow her whenever they can... just to make a shot of a glimp in her eyes (which can destroy a person's sense of privacy), and it can easily become an annoying/humiliating experience for any person that gets confronted with way too much attention. I hope the the British couple will continue to do fine as they appear these days. Yes William and Kate do look normal and stable, but how people appear and really are can be two entirely different things. Kate is, or appearing, to be coping much better than Diana did or could and she does appear relaxed and enjoying everything. I am wondering, though, what if they did turn out to be fine, loyal, faithful to each other and create a family the country could look up to and be proud of, how then would they get on with all the other family members, the adulterers, divorcees, drunks, debauchers and those who get into corrupt business deals, on the pretence they are doing a service to the country and in reality they are lining their own pockets even further. That was interesting the magazine you showed, we never hear of these rumours or whatever they are. They are very good at covering things up here in Britain. I think they could teach the Italian Mafia a few tricks. However, if , in the off chance,this did turn out to be true, they will announce the baby was premature, although it would probably weigh in about 10lbs. is it for shure that Prince William is a left hander and what are your sources about it? ps. : I have made the horoscopes about GB /Transits, Prince William and some others. I'll put them in later. Martijn, I continued in the other thread about Prince William. Yes, he writes with his left hand - which is usually THE most simple criterium to describe a person as left handed. Remarcable: The very long ring finger and the short Saturn. Manfred wrote: Remarcable: The very long ring finger and the short Saturn. Hi Manfred, I assume you made this observation for Kate's hand...? Yes Manfred, I can confirm that her middle finger is slightly short and her ring finger slightly long. But I would prefer to described this combination as 'related': it is actually a relatively normal combination because the impression of the 'long ring finger' is... a direct result of the relatively short middle finger! The long ring finger would have become much more remarkable when the middle finger had been long as well. Manfred, did I understand your words properly...? I agree with you in the point of the length relations. I think the fingers are slim at this stressy times and have an aesthetic outlook. Remarcable, because I would await a stronger Saturn on the hand of a getting Queen - and a natural Capricorn. I'm not really shure at the moment why and first have to paint the chart in my own style. 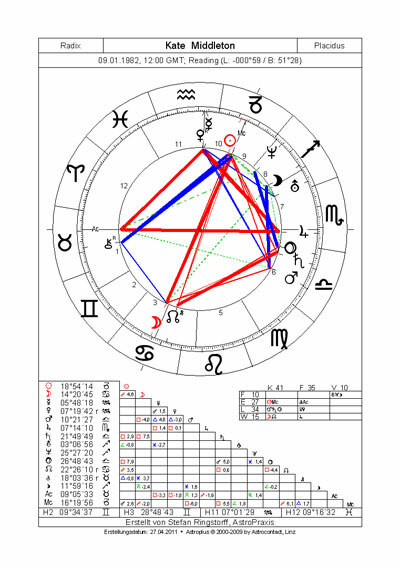 In the birth chart we find Saturn (in conj. with Pluto) still in a strong position, in Libra in combination with Mars in Libra what means a strong feeling for fairness and forms in art (architecture), too. Perhaps the Venus in Aquarius (a Saturn sign with the containt of mental structure and together with the Mercury an ability for quick intuitions) gives her a note for autonomy. This I would bring together with the shape of her Ring and Saturn fingers. All in all I would await some inner conflict or tension between traditional values and the leaning for exciting new ways. - A nice expression would be perhaps to build up some exciting new buildings. I strongly feel Kate will be a very dominant influence, and find the Saturn finger with a distinct deviation will exacerbate this. Her hands for me show a very strong Air aspect which will facilitate a long term planning capacity with the masculine finger ratio reflecting a capacity for calculated risk. I see the Apollo (ring) finger on her right hand especially to indicate a desire to be acknowledged and praised, to appreciate (on the master path) the ability to receive applause. So that is a benefit for her role. Kate's thumb is very high set and 'in' so she will be a good follower, not needing to have her own queendom to run. She will do well following the rules and lead of others. The only question I see with that process is that her pinkie on both hands (as was true for Diana) is that she has an 'independent thinker' relationship - meaning her pinkie stands out a bit away from her Apollo finger on both hands. She may have some thoughts of her own, her independent thoughts but will find a way to integrate them into the requirements of her duties because of her thumb. Daily Mail Scotland, July 6th 2011. Thanks for sending me this newspaper article Jeanette. Sorry for delay in posting it - I only just got chance to get it photocopied at reduced size (the page was too large to scan). Thanks Lynn for fixing the article for posting. I would like to know what others think of the statement they both have narrow spaces between heart and head line. I would not have thought the spaces were narrow. Hopefully others will give their opinion on this and also what they think of the article as a whole, as I don't think it is very good. Every statement, to me, is made to fit. I am happy to hear you saying: 'I don't think it is very good'. Also, the article is an example of 'old-fashioned' hand reading: because it suggests that every single hand characteristic has a specific meaning. Though I should fairly add here that I tend to describe far most books about palmistry as 'old-fashioned' because the authors usually do not describe how to combine hand characteristics... which is really a requirement to make thorough analysis. Anyway, Jeanette... thanks for sharing the article!